World of Oz is a newly launched video slot machine developed by Rival. Naturally, it revolves around Dorothy’s adventures in the Land of Oz. This is a nice and playful slot, with colorful design, special Dropping symbols and 2 Tier Free spins feature. The downside is that the lifetime RTP is below the average for Rival slots, with 95.34%. Naturally, it’s not the first game based on this theme. The most popular is WMS Wizard of Oz slot machine. Unfortunately, the WMS version is not available to US real money casino players. 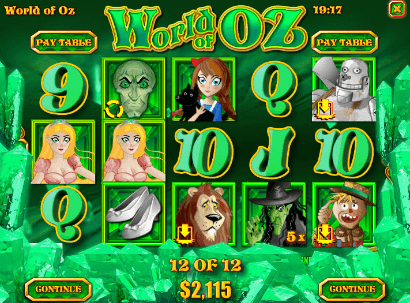 The high paying symbols of the World of Oz slot are the figures popular tale. First you have Dorothy and Toto symbol, which pays 750x your bet per line. Next you have The Scare crow, Tin man and the Lion, which are also the Drop Icons – those pay 300x your bet per line. The Wicked Witch is the wild symbols which also serves as a x5 multiplier. The Drop feature (usually referred as collapsing), is activated when you get 3 similar Drop symbols anywhere on the reels. When it happens the drop icons disappear and new symbols fall into their space, creating new winning combinations. The free spins at World of Oz slot have 2 levels, Super Round and Emerald. When you get 3 or more Free Spins symbols, you will be awarded with 12 Super Round free spins. 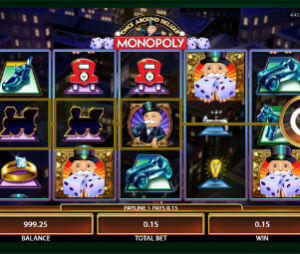 Then, if you hit them again during the free spins mode, you will be transferred to Emerald spins mode, with 7 free spins. Great feature that barely missed our Top 7 slot machines with free spins rating. It is fun and happens quite often. The drawback is that the only difference between the two modes is the Wild multiplier, which goes from x5 to x10. It seems that Rival could do a bit more with that feature. Select Lines: from 1 to 50. (You can also use the arrows on the sides of the game). Bet Max: Bets 10 coins x 50 lines according to the chosen denomination. Additional buttons are Spin and Autospin. Cute 5 reel, 50 lines slot. The dropping feature and 2-tier free spins are nice and appear often, but the payouts during the regular play and the free spins are not high. It’s a fun low volatility slot which allows long play time, but don’t expect huge wins. If you are looking for something more edgy, you should check out Rival’s new Tycoon Towers slot. You can also try some of our Free Rival slots.